When I first tell my friends I shower at Truck Stops while out on the road I get a weird, disgusted look from them as if it’s the dirtiest thing ever. Lol. Well I’m here to help clear the air on a very good option for staying clean while on the road. Often times I’m not staying at a Campground or State Park that has showers so when I’m in need of one I simply look for the nearest Truck Stop. The ones I’ve been using have been TravelCenters of America, or TA Truck Stops for short. Showers cost $13.00 and you can simply ask the cashier working the register that you’d “Like to purchase a shower.” They’ll ring you up and hand you a Shower Receipt. It’ll display what Shower Room Number is assigned to you as well as a PIN Number to enter in order to get access to your room. It’s also worth noting that there may also be a Shower Kiosk where you can purchase your shower without having to ask the cashier. I prefer asking the cashier because I can also ask how many people are in line for a shower. I’ve learned that stopping in for a shower in the evening is the WORST. I tried the evenings twice and the lines had anywhere from 15 to 27 people waiting. Not good. The best times I’ve found are mid morning…8-11am or so. There’s always an open Shower Room, no waiting! Once you’ve received your Shower Room receipt, you’ll walk back to the Shower Room area of the store. 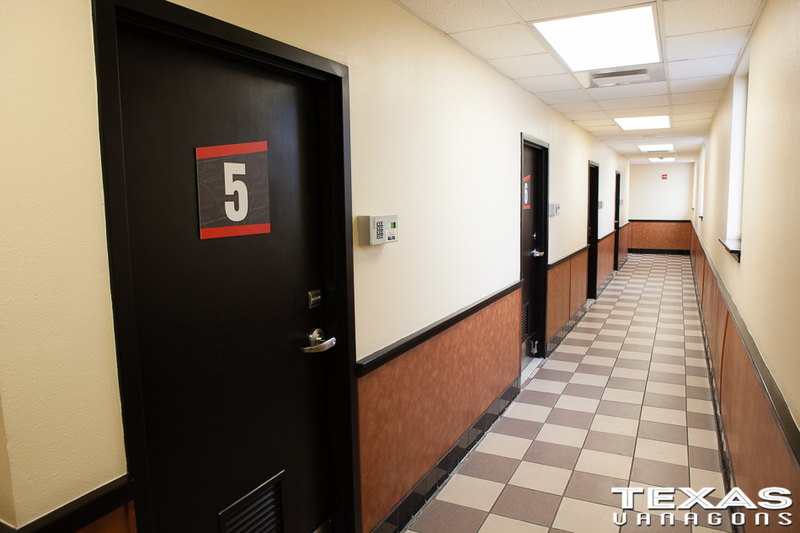 You’ll notice a bunch of numbered Shower Rooms. 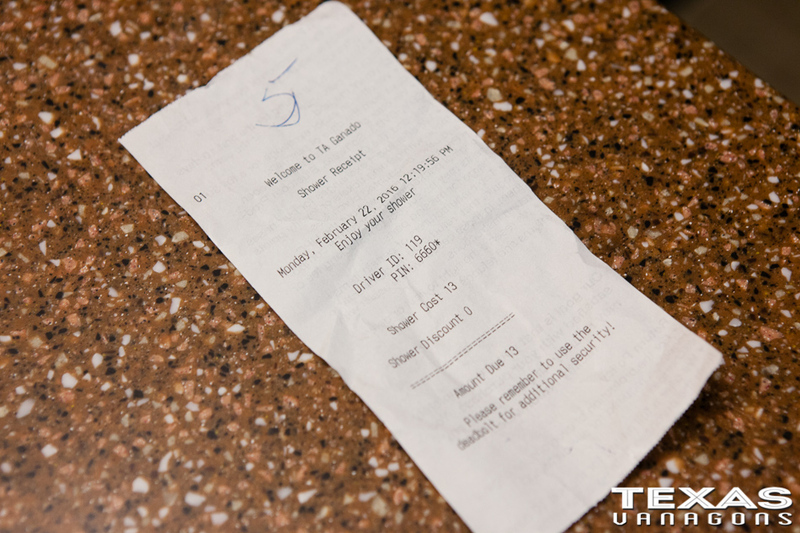 Simply find the one marked on your receipt, Shower Room 5 in my case. 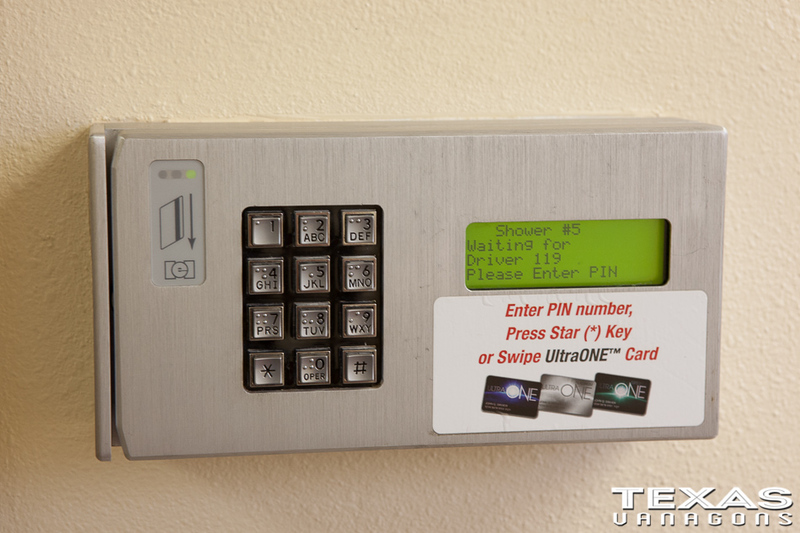 Enter in the PIN Number found on the receipt and the door will unlock and you’ll be let in. Each Shower Room is like its own hotel bathroom. Complete with sink, mirror, toilet and of course your standup shower. Nothing like the creepy community showers I’m sure my friends envisioned when they heard the words “Truck Stop Shower” come out of my mouth. Ha! The Shower Rooms are definitely nicer than the bath houses I’ve seen at many state parks and I’d even say they’re nicer than many of the $100-$150 a night hotel rooms I’ve stayed at. 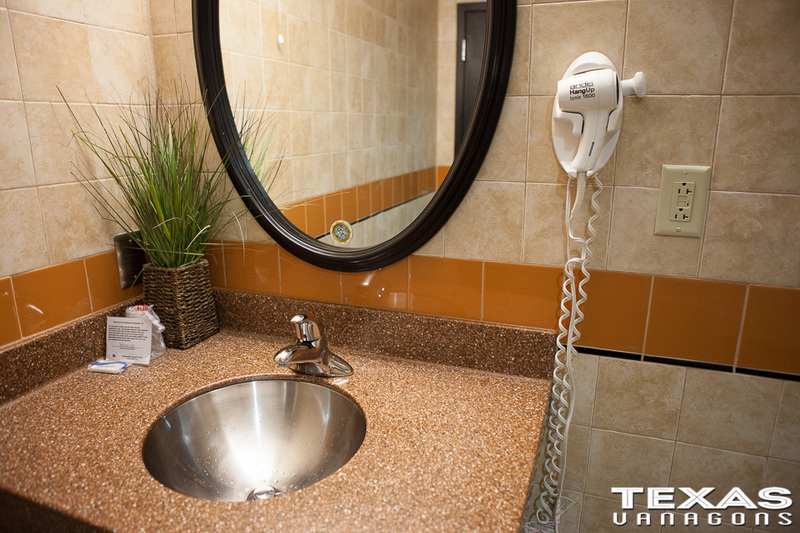 The vanity area is nice so you can brush your teeth, shave and blow dry your hair. You can even plug your phone charger up and get a good charge while you freshen up. 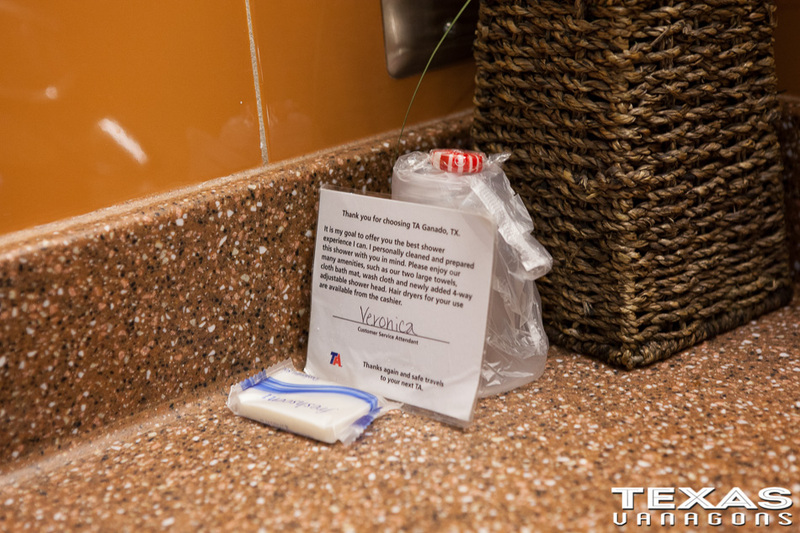 Much like hotels, these TA Truck Stops have attendants that are in charge of disinfecting and cleaning each Shower Room after use and get it ready for the next person in line. I’ve never been in a Shower Room that was less than spotless so you germaphobes out there needn’t worry. 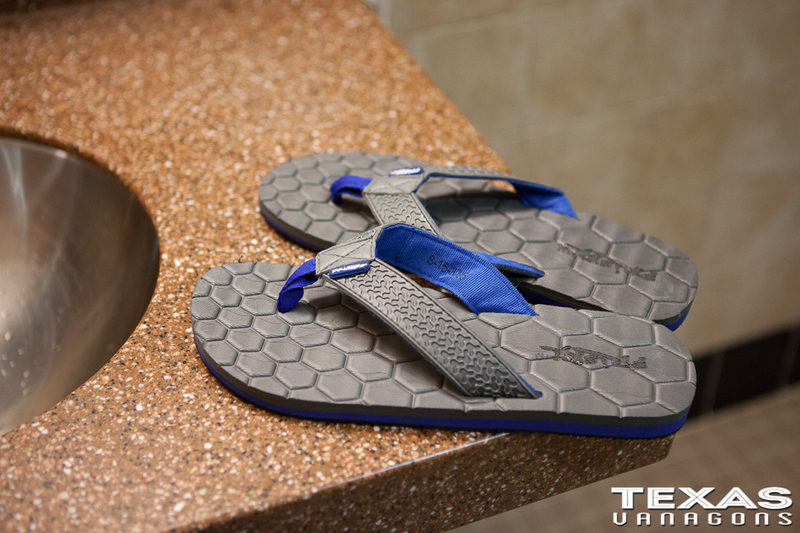 The one thing I do recommend… in ANY public shower is to wear a pair of Flip Flops at all times. No matter if you’re showering in a truck stop, state park or hotel. Wear Flip Flops! I had a friend get a Staph Infection on his foot from a public shower and he nearly had to have it amputated. No lie. One of the many pluses of showering at a Truck Stop is they provide clean bath towels for you to use. So there’s no need to bring your own and have to worry about drying it while driving. Wash rag, hair towel, two full size towels and a bath floor mat are provided. Plenty of hooks to hang your clothes and shower bags from. 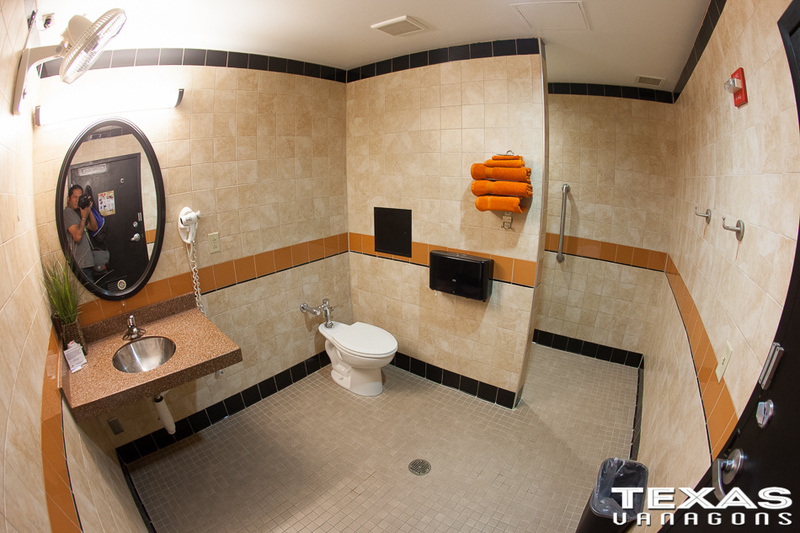 They provide a bar of hand soap at the vanity and a liquid body wash dispenser in the shower. You provide your own shampoo and conditioner. There are many options when it comes to being able to take a shower while on the road but many van dwellers for some reason don’t consider Truck Stops. Hopefully this will help them see what a Truck Stop shower looks like and realize its not such a bad thing after all. I agree the price is a bit high when compared to a night’s stay at a campground but when you need a good, never ending hot shower after a few days of roughing it out in the cold desert then $13 seems like a great bargain! Thank you Alex. I do appreciate it. Thanks for the info. And for adding good photos. Do you suppose two could get in there or are they watching for such hanky panky? They really don’t watch for it so I’m sure it’s pretty easy to get two people in there… I know I’m going to try that route. My husband and I have used a single shower at truck stops for the both of us many times. Even asked the first time to see if it was ok! 🙂 There was no problem they said. Thanks for writing this up Abel! Oops! Read my #11 post below. Can you and your female friend that you met in the parking lot use the shower together?? You’re very welcome. That’s the main reason I wanted it documented was to help shed some light on how cool these showers actually are. 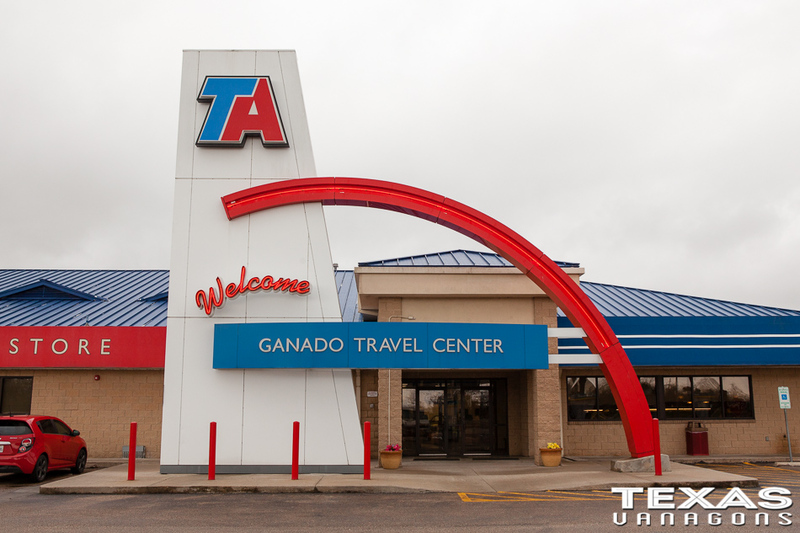 Most of the Truck Stops also have a full laundromat as well so if you need to do laundry on the road this is a good stop as well. We used Pilot and Flying J truck stops across the USA a few years ago. Here’s a tip. 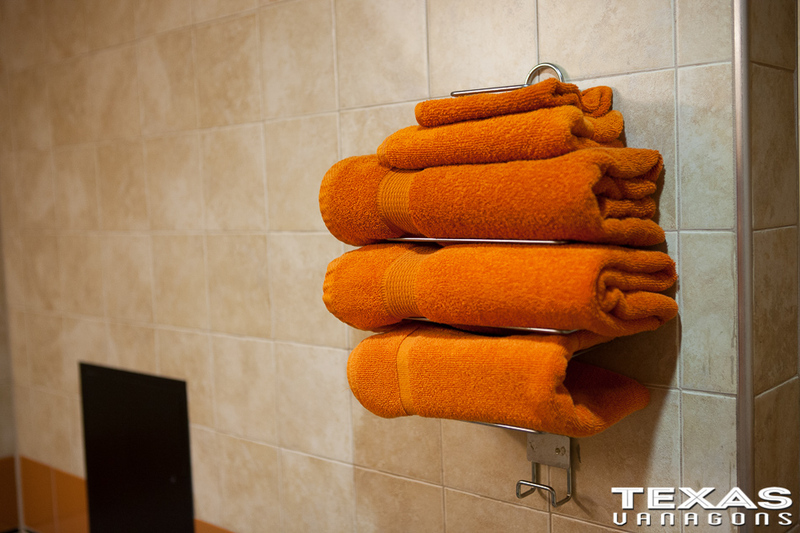 Many offer free showers with a fuel purchase. Typically 100 gallons. We showered free most of the time by simply asking the clerk if a shower was available. They charged it against the last driver that filled their rig’s fuel purchase. Easy peasy. I am sure we all would like to hear where you feel the best and worst showers are located. Please include truck stop name. hwy number, city, state, mile marker, or at your discretion as to information if they are that bad. I was an over the road truck driver for many years. You are correct about the state of the showers at the major truck stop chains. As long as the truck stop is part of a larger chain (Pilot/Flying J, TA, Loves, etc.) the showers are very nice and clean. I would recommend getting the free frequent fueler cards and then you can build up to a free shower after 100 gallons of petrol (some chains only require 50 gallons). Also, if you say that you are team drivers, they will usually give you 2 showers for the price of one. Used the truckstops many times over the years! A wonderful accommodation. Also, your upscale nicer RV parks usually offer on Saturday a pot-luck noonish dinner where the park puts on the meat and potatoes and the park guests will bring various dishes for a real feast. We’d check in Friday afternoon for the night (research and reservations are strongly suggested ahead of time). This gave us a Saturday to enjoy a dynomite meal, (we didn’t cook a dish rather, offer a modest donation ($5) to the park. Most always they would say “keep your money and come enjoy anyway”) relaxing showers and swimming for the day before heading out late afternoon on our way to find a perfect place to pop the top for the night. Make use of their dry camp area for economy too. For #3 Geneva above. My wife and I with 2 younger boys would bath together wherever it was convenient in a lake, stream, river, RV parks (just for drop in showers) and TruckStops. Ask the attendant if they’d cut you a deal considering, my excuse was “we needed to know the boys were scrubbing themselves well to get the crud off”. Most of the time we were allowed to “family up”. If, the charge was $10 bucks per we’d be charged $15 for all in the pool and many times the base charge for one person was good for us all, as long as we were prompt as we could be. Thanks for clearing up the mystery of truck stop showers. I’d always imagined some grungy, moldy, streaked petri dish of…well, never mind…a trans continental health hazard where even ebola won’t go. The fact they provide towels is good to know.